Book your Spring Steelhead Fishing Trip Today! Spring is a great time to fish for steelhead in Michigan! Steelhead provide exciting spring fishing trips in northern Michigan. These beautiful battlers make blazing fast runs, exhilarating leaps, and will provide memories to last a lifetime. There are big runs of spring-run steelhead that come up the Lake Michigan tributary rivers, and coupled with the fall-run fish that wintered over in the rivers, there are many angling opportunities for these awesome fish. Guided spring steelhead fishing trips are a terrific way to enjoy the beauty and serenity of Michigan's rivers while at the same time fishing and learning from experienced guides. A hot, grilled lunch is provided with all full-day guided fishing trips. For fly anglers, simple and highly effective beads are a preferred choice for our Guides. Beads imitate steelhead eggs, bouncing along the river's bottom, and are a tremendous option for success. Egg flies are another guide favorite among the Wolfe Outfitters fly fishing Guides. These are often tied in tandem with stonefly nymphs for steelhead holding by gravel. Stoneflies are a proven way to tempt steelhead during the spring as stoneflies are dislodged by steelhead fanning the river's gravel making their nests in which they lay their eggs. A natural option that provides protein for spawning steelhead, stoneflies can often be the keys to success during spring steelhead trips. Also, for our fly anglers, we offer the option to use two-handed rods for switch rod or spey techniques, fishing the waters through the use of cross-current drift. The beautifully colored flies used can yield heart-stopping strikes. While swung flies may not be the best option for numbers of fish, the pure artistry and satisfaction that comes from a steelhead caught on a swung fly is among the highest levels of distinction in the sport of fly angling. For conventional gear anglers, Wolfe Outfitters uses many different techniques to tempt spring steelhead. During the cold water periods, in early spring, a jig tipped with wax worms is often times the ticket. Different style jigs, in different colors can also play a big role in the success on the day. Water clarity plays a big part in what might tempt a steelhead, as does time of day. Cured salmon or steelhead eggs can also be a great way to have a fantastic day on the water. Different colored mesh netting create different looks and color variations, and it's very common for steelhead to key in on a particular color in any given day. Having a variety of colors can be the difference maker in having a good day on the water and having a banner day on the water! Cured egg presentations can be fished in a few different methods. Rolling spawn along the bottom is great when fish are holding on the river bottom. Feeling the bite is an incredible feeling, and one that anglers are addicted to. And similar to the fly anglers, beads can also play an important role in putting fish in the boat. Beads in different sizes and colors are often experimented with to find the exact combination that steelhead want. Also equally productive are fishing spawn bags under a float. This is an incredibly fun way to fish for steelhead, and is a deadly technique. Fish that are suspended slightly in the river's current are often taken with float techniques, and setting the hook on a steelhead that pulled down a float is a treat not to be missed. Spinners can be an interesting option as the waters warm, and the fish get more aggressive as spring goes on. It's also not uncommon to hook a few trout with spinners as well. Resident and stocked trout include rainbows and brown trout. Walleyes run into the rivers to spawn as well, and it's not uncommon to hook into these great tasting fish. The walleye season is closed on rivers and inland lakes, so any of these fish that are caught before the season opener in late April must be thrown back. But after the opener, walleyes may be kept for the dinner table! Spring steelhead trips can be done from our either drift boats or jet-sleds. 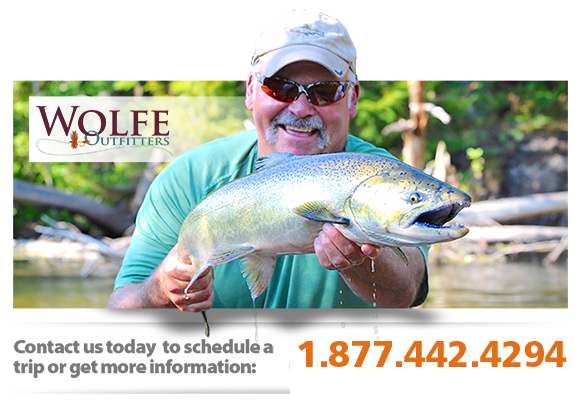 Most of Wolfe Outfitters's steelhead fishing trips will be on the Big Manistee River. The Betsie and Platte Rivers are also great as well. These smaller rivers can be fished from a drift boat, and can out-fish the Manistee at times. Traverse City's Boardman River may also be an option, depending on the rate of thawing. In general, the Manistee River has the largest flow, and creates the best opportunities for guided spring steelhead fishing trips. What to Wear: Properly layered clothing is essential. Spring weather can be unpredictable, and layering can be important. It's always better to be overly dressed and peel a few layers off rather than being cold. Any wind coming off of the cold river waters can make even a warm day on shore chilly when fishing. Polarized sunglasses are key, not only in protecting the eyes, but also in helping to see underwater contours and fish holding in the water. Sunscreen is another must-have, as the spring sun becomes more intense.